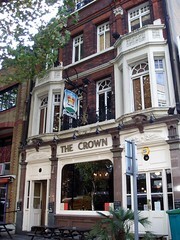 A fine pub for beer lovers, on Blackfriars Road, not too far from Southwark Station. The pub inside is high-ceilinged, bright and airy, with plenty of large tables. There's a beer garden holding 8-10 tables down some steep steps at the back, as well as some seating out the front. There's a function room upstairs. On Ewan's Friday evening visit, there was still space to sit down (though as it was the Summer, the garden was full) and we were able to seat a large group of people. It's less busy on the weekend, and is a very pleasant pub for Saturday and Sunday lunch. There are now three handpulls for ale, all regularly changing (the website advertises a Dark Star month in May 2011, for example). On Ewan's April 2011 visit, the three ales were Redemption Hopspur, Windsor & Eton Knights of the Garter, and Rooster Stars & Stripes, all well-kept. There's also a great variety of keg beers, including Brooklyn Lager and Anchor Steam on tap, Paulaner Munchen and Wheat, Budvar Blonde and Dark (as well as half-and-half), and plenty of others, including a good variety of bottled beers (from the USA and other countries). Food is served for lunch and in the evenings, focusing on burgers (with some vegetarian options), though they also have a good range of bar bites and smaller dishes, and organise BBQs outside during Summer. Ewan's verdict: A very promising pub for beer drinkers, with plenty available on tap and in the fridge. Definitely worth a visit, if in the area. Last visited by Ewan, Kerry, and friends, April 2011. Last edited 2017-02-24 11:12:27 (version 7; diff). List all versions. Page last edited 2017-02-24 11:12:27 (version 7).